Description When Harry and his best friends go back for their third year at Hogwarts, the atmosphere is tense. There's an escaped mass-murderer on the loose and the sinister prison guards of Azkaban have been called in to guard the school. Lessons, however, must go on and there are lots of new subjects in third year - Care of Magical Creatures and Divination among others - to take Harry's mind off things! 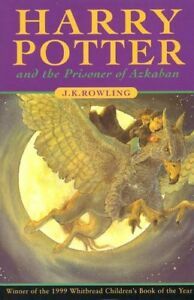 Author Biography Since publication of Harry Potter and the Philosopher's Stone in 1997, the Harry Potter novels have sold 350 million copies worldwide and have been translated into 64 languages. J.K. Rowling has generated huge popular appeal for her books across the generations in an unprecedented fashion: she was the first children's author to be voted the BA Author of the Year, and also to win the British Book Awards Author of the Year. Prizes Winner of Whitaker Platinum Book Award 2001 and Good Book Guide Award 2000 and Whitbread Book Awards: Children's Book Category 1999 and Smarties Book Prize 9-11 Category 1999 and Smarties Book Prize Gold Award 1999 and Whitbread Prize (Children's Book) 1999. Runner-up for The BBC Big Read Top 100 2003. Shortlisted for BBC Big Read Top 100 2003 and Blue Peter Book Award 2000 and Carnegie Medal 2000 and LA Carnegie Medal 2000 and Guardian Children's Fiction Prize 2000.